Expand your home decor options without sacrificing quality when you choose laminate flooring options that fit any budget. With its wide variety of sophisticated designs and vibrant colors, our full line of laminates offers great value, smartly balanced with superior durability and aesthetic appeal. Whether you select laminate wood flooring or laminate tile flooring, our experience, professionalism, and attention to detail will help you make your new flooring project a success. If you enjoy the luxurious look and feel of hardwood but are concerned with the cost, our laminate wood flooring provides an incredible alternative at a lower price point. Laminates are a perennial favorite among homeowners because of their ability to reproduce the gorgeous appearance of wood plank flooring. In addition to their beauty, laminate floors are among our most affordable options. 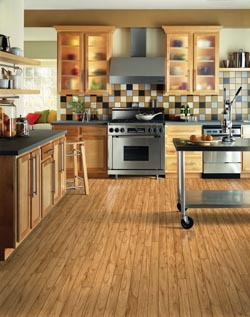 Compared to hardwood, a new laminate floor can save you hundreds to thousands of dollars in materials and labor. Though price alone makes laminate wood an attractive flooring option, its durability and defect-free installation make it a wise investment. Laminate's hard-wearing surface resists dents and scratches. While no wood floor will hold up to standing water, laminate tolerates moisture or humidity in areas where hardwood cannot, such as basements and utility rooms. Laminate also requires no acclimation, which means your new floor can be installed the same day it arrives. Add the warmth and refinement of stone to your home without the expense and effort when you choose one of our laminate tile flooring designs. With its wide array of patterns and hues, our laminate tile collection offers an alternative to stone that produces stunning results while taking it easy on your wallet. In addition to its lower cost and striking appearance, laminate tile also offers quick installation. Each plank of laminate is equal to multiple tiles, allowing for superior coverage per piece. Laminate tile also installs easily over most existing floors, which means your gorgeous new floor can be laid in an afternoon with little to no prep or demolition. Whether your sense of style leans toward the traditional or you prefer modern and contemporary trends, our line of laminate floors offers a perfect match for any taste. We remain on the forefront of industry innovations and update our offerings every season. By keeping our inventory up to date, we are able to assure you can choose from the most diverse range of flooring options, including the latest in laminate designs. We help you discover the right look for your property, from new twists on classic designs to popular patterns for modern homes. Once you've found a flooring material, color, and design that ignites your imagination, rely on our laminate flooring installation professionals to make it a reality in your home. Our knowledgeable staff arrives promptly on site to install your choice of laminate flooring to your exact specifications. You can count on our experts to complete every job correctly the first time, and stand behind our work with a lifetime installation guarantee. Contact us today, and allow our friendly laminate flooring professionals to help design and install lovely new floors in your Turlock, California, home.